I shoot my feet back burpee-style and flatten my body against the stand-up paddleboard. The Escalante River has become a tunnel of vegetation so narrow that there’s no difference between middle of the stream and edge of the bank. My right forearm linchpins the paddle as I grip the railing of the SUP. I swing my left arm up over my head to guard against the branches of overgrown Russian olive trees. Swept forward by the current, I float into another splay of bony branches. They scour my bare skin. But there’s something worse than the scrapes—spiders sprinkling down all over me. Stuck in this molasses-paced conga line on the choked river, our five-person crew pushes, drags and canoe-paddles our SUPs for six miles from the put-in below the bridge along Utah Highway 12. 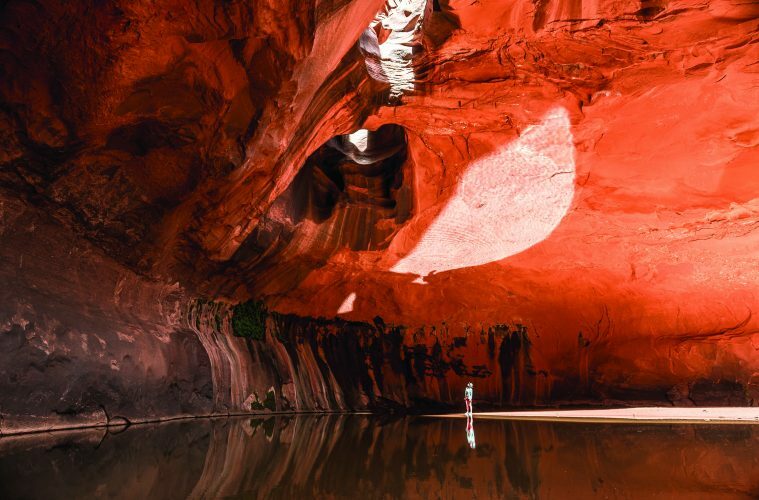 At last, the initial stretch of backcountry brush gives way and the Escalante begins to zigzag erratically through cliffs, terraces and Navajo Sandstone walls that tower hundreds and hundreds of feet above the water. On a map, the river’s silhouette resembles a series of sporadic spikes on a cardiac monitor, and that’s just how it feels to paddle it. It seesaws you back and forth between peace and adrenaline. My buddy Dylan Brown gives me a quick lesson on paddle techniques—I’d paddled SUP on ocean a few times but never on whitewater—and as I start to get the rhythm, a sleeper beneath the current catches my board and I fly off. Fortunately, I land on two feet, and rush to grab my SUP before it ditches me. Six weeks earlier, Dylan—a talented videographer-photographer—asked if I’d join him on what would be the desert river’s first-ever recorded SUP run. It was to be a trip down the entire length of the Escalante, 100 miles in five days. 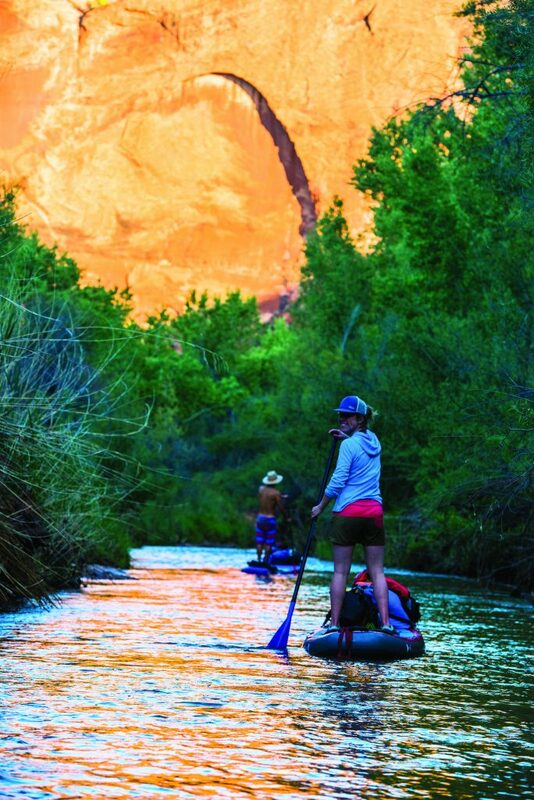 Typically, paddlers take about 10 days to steer blowup kayaks or packrafts at a leisurely pace down the Escalante’s brown vein to Coyote Gulch—around mile 75—and then exit via the Crack-in-the-Wall slot: a 1,000-foot ascent, which features a 600-foot sand slope and a narrow passage that requires a 30-foot rope to pull up gear. The closest trailhead, Fortymile Ridge, is then a five-mile trek out. We would go farther. This area is in Dylan’s blood. He grew up exploring the desert canyons that surround the town of Escalante, which his parents have called home for more than two decades. In 2011, he paddled the Escalante River in inflatable kayaks with his dad and four friends. Afterward, he wondered what the experience would be like on an inflatable SUP: a versatile vehicle with options to sit or stand for a higher vantage point, a lean belly that reduced drag potential in low water levels, plus an advantageous surface area for strapping on gear. Stand-up paddleboarding in the U.S. has experienced more growth than any other outdoor activity since 2012, according to the Outdoor Industry Association. No surprise, the largest percentage of stand-up paddleboarders live in the country’s Pacific and South Atlantic regions. But recently, multi-day whitewater adventurers have been ticking off SUP objectives. Last year saw several other first SUP descents besides ours, including SOL Founder Johnny Lombino’s dance down the famed class IV Snaggletooth Rapid on Colorado’s Dolores River. And Paul Clark and Torrey Piatt made an inaugural swoop of the Upper and Middle Owyhee River in Idaho and Oregon. For our SUP expedition, we planned to move fast, so we only packed the essentials. The trickiest part was timing our trip with the runoff. Each spring, snowmelt from the Aquarius Plateau pours eastward into the head of the Escalante. If winter’s precipitation is insubstantial, the runoff loses power and the overall window to paddle grows even narrower. If a crazy storm hits, the snowmelt refreezes and the flow nozzle shuts off. That was the case for us. Our initial send date was April 23, but a series of spring squalls blew in off the Pacific that blanketed the West in snow, and delayed the river flow. So we postponed. We wanted to catch at least a few days of consistent warm weather that would maintain the flow. If we waited too long, we risked losing our window to run the river altogether. The erratic weather could also get worse, and we’d end up paddling with icy rain and flash floods the entire time. We committed to drop the Escalante on May 12, three weeks later. Prior to push off, the BLM recommended at least 50 cubic feet per second (CFS). The only gauging station for the Escalante lies upstream from our put-in and it read an unpromising flow of eight CFS, a few days before we launched. Between the gauge and the bridge, however, three considerable tributaries boost the current. Then, six miles downstream from Highway 12, one of the most significant tributaries, Boulder Creek, feeds in. We reckoned there’d be enough water, eventually. Undaunted by the need to make a close slither in the tunnel of Russian olives above the river’s vibrant kaleidoscope of rocks at the put in, we took the chance. When we finally do reach Boulder Creek, hoots and hollers erupt in celebration. The flow sure does kick up here, as does the size of the rocks in the stream. I start to get the rhythm of steering my boat around boulders, debris and ripples in the water, which are all mellow precursors to the challenges upstream: mostly Class III rapids with quick turns, boulder jams and a few portages. Some dicey sections can even surge to Class IV+, a challenge—or, for some, impossible—on a SUP. Just before sunset, we reach an immaculate cove of white sand. We pull our boats to the welcome camp and light a fire beneath the clear sky. Living in Denver, I’ve become acclimated to the inevitable veil of smog and light pollution that drowns out the stars. It always amazes me how I forget this view, this giant black abyss with a overwhelming design of white pinpoints. The more my eyes adjust, the more I see. In the crisp morning air, we push off. A maze of unique rock formations—gigantic fins, tall pinnacles, crescent alcoves and narrow slot canyons—unfolds in front of us. The canyon walls tell geologic stories: They are 150-million-year-old petrified sand dunes coated with vertical streaks of a dark indigo varnish. As we paddle into each bend, I feel a beat of excitement for what we might find around the next corner. Dipping my paddle from side to side of the SUP, I think about the humans who first discovered this place. Ancient people lived and survived in these canyons for tens of thousands of years. In modern times, geographer Almon Harris Thompson and nine men set out on horseback from the Mormon settlement of Kanab in 1872 to find a cached vessel in this desert—they discovered the Escalante instead. It was the last uncharted river in the U.S. Mapping the complex hoodoos, minarets and canyon arms that burrow up to 6,000-feet deep took six years to complete. In 1996, President Bill Clinton designated Grand Staircase-Escalante National Monument (GSENM), much to the chagrin of today’s local politicians who are seeking to not just get rid of it, but most federal lands in Utah. At the time, oil and coal-mining companies vied for the land, conservationists sought its protection and recreationalists and ranchers wanted the space to remain unrestricted. The proclamation that created the 1.9-million-acre monument—delivered in a ceremony at the South Rim of the Grand Canyon—came as a complete surprise. While it was welcome news to conservationists, it incensed Utah legislators and many locals who sent their children to school wearing black armbands in protest to what they saw as federal overreach. The monument is more than its boundaries, however. The ecosystem that encircles GSENM—including Capitol Reef and Bryce Canyon national parks, Dixie National Forest, Paria Canyon-Vermilion Cliffs Wilderness and Glen Canyon National Recreation Area—creates a vast, rare contiguous area that’s crucial for migration, evolutionary potential and the preservation of 225-million-year-old geological wonders. The total acreage of this precious place is more than 5.5 million acres. The monument and surrounding area are also becoming more popular as a recreation destination. Four years after it was created, Grand Staircase-Escalante’s number of annual visitors expanded by 35 percent over the next 13 years—until 2014, which saw a 16-percent spike in visitation in a single year. GSENM’s tally of recreationalists has continued to grow, and it reached its highest count of 930,000 people in 2016. Despite that value both to natural and human worlds, the monument is in danger. It’s in the crosshairs of an executive order from President Trump demanding that Secretary of the Interior Ryan Zinke reassess and possibly cut back or rescind monuments that cover 100,000 acres or more and were created since 1996—the same year that Clinton created GSENM. The amount of land under speculation totals to more than 11.3 million acres, plus another 218 million acres of marine national monuments. As all of us—scientists, geologists, tribes, conservationists and recreationalists—face losing such a massive amount of precious space and legacy. My stomach tightens. Once a pure place is deemed permissible for commodity and altered it never comes back. I think about the construction of Glen Canyon Dam—natural arches, petroglyphs, secret side canyons and even wildlife buried alive, beneath the water. Those raw treasures took hundreds of thousands—and in some cases millions—of years to form. They carried human heritage, and they reinvigorated the spirit of their witnesses. I also reflect on the decade-long legal battle to prevent development in the box canyon where I was raised. Telluridans and countrywide donors eventually secured the Valley Floor’s preservation: A 570-acre, timeless win. There is hope. Near our halfway mark, the canyon tightens. The walls on either side soar, doubling to 1,000 feet over our heads. The horseshoe bends become unbelievably wide—some a half-mile long. My racing mind slows as I consider the time and scale of this ancient, grandiose gorge. This personal shift has taken days, but I’ve fallen into a cadence with the water. A fundamental need to live and survive in the moment allows my psyche a reprieve from my own anxious narratives and 21st century chaos. The gradual growth of the ravine dwarfs me more than physically. I stare up in complete awe, reminded of how small I am and how short my time on this planet will be. I think back to the trip, to a moment when, unexpectedly, the river opened up and we found ourselves surrounded by velvety crimson and pearl dunes, enclosed by a solid fortress of bizarre sandstone buttes. I felt overwhelmed with what my grandparents also felt in the remoteness of this canyon, what anyone can feel here: a distilled bliss rooted to simply being alive, amazed and present. It’s something you can only experience in a space that is forever and completely wild.